Western explorers settled in China more than 1,500 years before Marco Polo, new research has shown, after archaeologists concluded that the Terracotta Warriors could have been made with the help of the Greeks. The 8,000 statues, which guard the mausoleum of the First Emperor, are likely to have been made under the guidance of a European sculptor who worked with locals at the site and took influence from Ancient Greece. An extensive study of sites in Xinjiang Province, China, has revealed European-specific mitochondrial DNA, suggesting Westerners travelled, settled and died there before and during the time of the First Emperor — 1,500 years earlier than currently accepted. 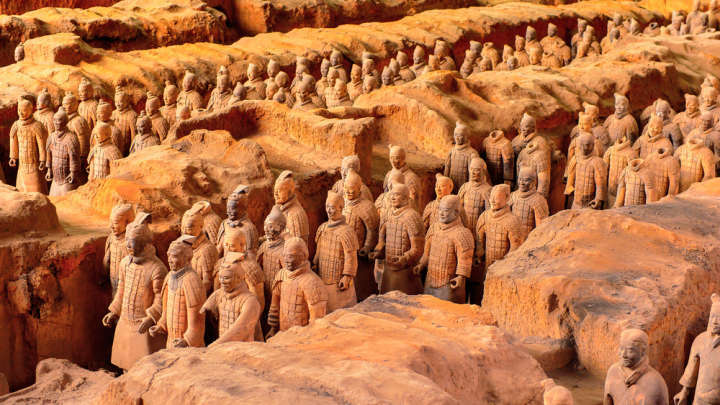 The discoveries have been hailed by the tomb’s lead archaeologist, Zhang Weixing, as “more important than anything in the last 40 years,” surpassing even the unearthing of the Terracotta Army itself in significance. It is thought to be the first documented contact between Western and Chinese civilizations. The findings came about during excavations across the site by mausoleum archaeologists, which have been documented for television by the National Geographic Channel and BBC. The tomb complex of the First Emperor, Qin Shi Huang, was found to be much bigger than first thought — at 38 square miles, 200 times bigger than Egypt’s Valley of the Kings. Two roads out of it were identified through a search with drones. Experts are particularly excited by the discovery of the DNA that suggests Westerners lived in the area during the time of the emperor, from 259 to 210 BC. Dr Li Xiuzhen, senior archaeologist at the tomb’s museum, said: “We now have evidence that close contact existed between the First Emperor’s China and the West before the formal opening of the Silk Road. This is far earlier than we formerly thought.” This evidence, experts believe, lies in the style of the Terracotta Warriors, as there was “no tradition of building life-sized human statues” found in China before then. Lukas Nickel, chair of Asian art history at the University of Vienna, believes the tomb was inspired by Greek statues in the era of Alexander the Great, with DNA evidence adding to his theories. “I imagine that a Greek sculptor may have been at the site to train the locals,” he said.